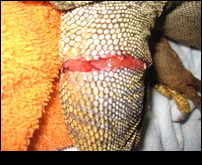 Iguana was attacked has flesh wound! **update** he saw the vet and had an antibiotic injection, and I have some pain med and topical cream for the wound. no bandage or stitches, he is resting comfortably now it looks like. Does this look bad he still has movement in the leg which is good. there also wasn't much blood. 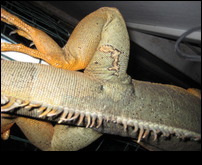 I would say this one is a little bit worse than when he bit my other iguana a long time ago in the same place, and it healed with no problems. This happened during a brief encounter when I was giving them a bath. look at the scar guess it was payback. same thing you could see muscle was pretty freak out then too but look at it now, I know its wicked gross sorry...anyone else have experience with anything like this? must happen a lot in the wild.